I don’t know if was divine intervention or just pure luck but this Japanese tomato noodle soup is one of the best soups I’ve ever created. I say “created” and not “made” because it’s truly an original recipe. You can’t google “Japanese tomato noodle soup” and come up with anything like it. I’m not trying to brag here, just being honest! It might even rival my Thai basil pesto soup for my favorite all-time soup creation. 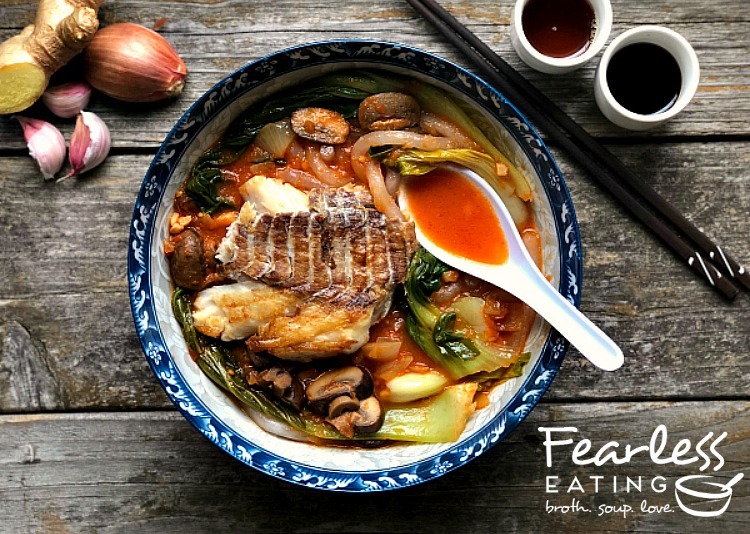 It has many of the classic ingredients of Japanese noodle soups – a dashi broth, fresh udon noodles, soy sauce, ginger, garlic, mushrooms and bok choy. But it’s the base of tomatoes and a dashi broth that makes it unique. 1. Use FRESH in-season tomatoes, if possible. FRESH tomatoes is the true purpose of this whole series! I’m hoping to expand your repertoire of ways to use fresh, local, organic in-season tomatoes in tomato soups beyond the typical (albeit delicious) tomato soups we all grew up with in America. If you’ve found this blog outside tomato season, try to avoid “fresh” supermarket tomatoes. They’re almost always picked before ripe and chemically treated to make them last longer. As a result, most taste like crap. In that case, it’s OK to use canned organic tomatoes in place of fresh ones. It’s also a good habit to skin and de-seed fresh tomatoes There’s multiple ways to do this. My friends Margaret and James have a great short video, How to Peel and De-Seed a Tomato, which goes through the different methods (and reasons why). 2. Make a homemade dashi broth and puree it with the tomatoes. To be clear, you don’t HAVE to do this. 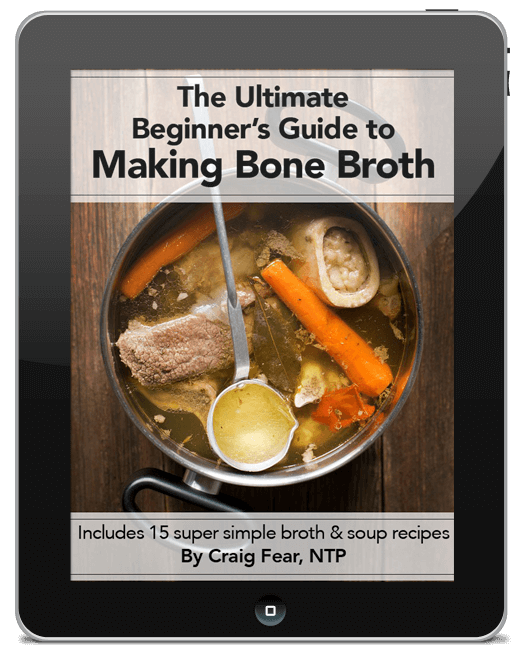 You can substitute fish broth, chicken broth (fish broth is the better choice) or even just water. But a dashi broth is uniquely Japanese and has a sublime briny umami flavor. It’s also stupid easy to make. All it takes is a few simple ingredients and about 30 minutes. 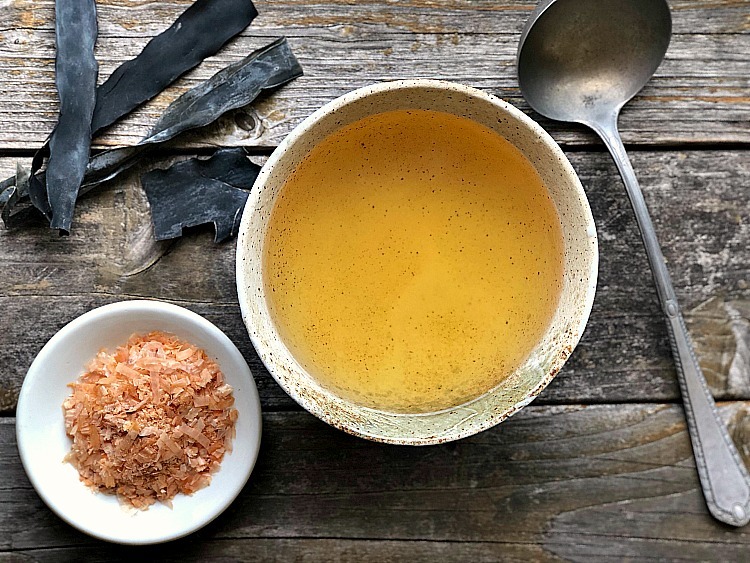 See my post How to Make a Japanese Dashi Broth. After you simmer the tomatoes for about 12-15 minutes in a stockpot, you’ll add the dashi broth and then puree it all together with an immersion blender. 3. Use FRESH udon noodles, if possible. Freshly made, good quality udon noodles are a totally different type of noodle than dried udon noodles. While the latter is easily found in packaged form, the former is not easy to find outside Asian markets. And even that’s no guarantee. Check in the refrigerated section, if there is one. Also, it should be noted that not all fresh noodles are good quality. Many have tons of preservatives and colorings. So if you can’t find good quality fresh ones noodles, it’s OK to use dried. Just know that in fresh form, they’re much larger in size and have a squishy, chewy tenderness that is superior in both texture and flavor. 4. Get some help, if possible. This is one of those home-cooked meals that requires a lot of things coming together at the same time. 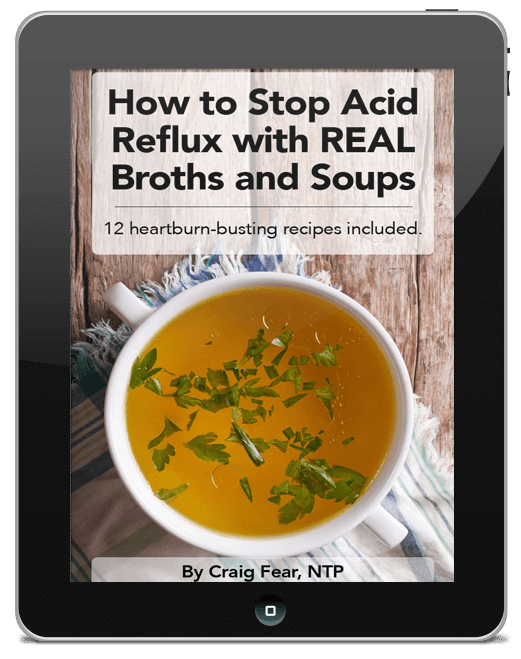 You could have all four stove top burners going a the same time with broth, veggies, fish and noodles and overcook or burn something. It’s easy to get overwhelmed. For example, fresh udon noodles only need to be simmered for a minute. They can easily turn to mush! And the fish can easily overcook too (if you’re pan frying it). Depending on the thickness of the filet you’re using, you want to saute each side for 3-5 minutes but leave the middle slightly undercooked. It will finish cooking in the hot broth and be nice and tender. A few extra pair of hands (and sets of eyes) will help ease the burden of trying to make this meal all by yourself. Sesame oil is a quintessential oil in Japanese cuisine and contributes a beautiful, nutty flavor to Japanese dishes. It’s a bit controversial in nutrition circles because it’s high in omega-6s (and thus is considered more pro-inflammatory) but it’s been used in Asian cooking for thousands of years. I use an unrefined, cold-pressed sesame oil (avoid refined sesame oils) for sauteing the veggies and fish. And then once the noodles are cooked and drained, I’ll mix them with a little toasted sesame oil for further flavor. You can add a little more to your individual bowl of soup (along with soy sauce) for further seasoning. 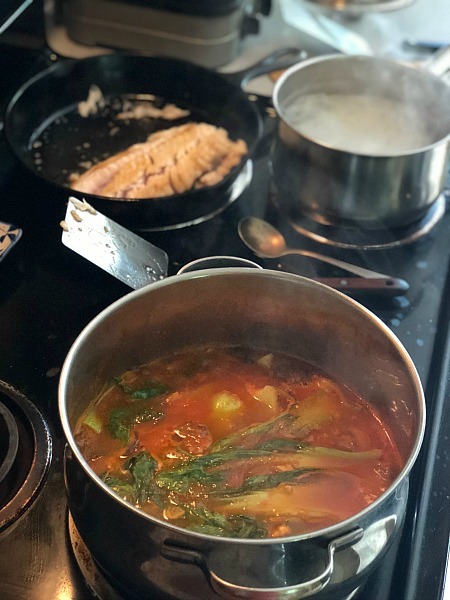 A Japanese tomato noodle soup has many of the classic ingredients of Japanese noodle soups - a dashi broth, fresh udon noodles, soy sauce, ginger, garlic, mushrooms and bok choy. But it's the base of tomatoes and a dashi broth together that makes it truly unique. 1 pound white fish cod, haddock, grouper, pollock, snapper, etc. Skin and de-seed tomatoes and roughly chop. Add 1 TBSP of oil to a sauce pan over medium heat, add tomatoes and simmer for 12-15 minutes, stirring on occasion. It should form a thick, soupy consistency. While tomatoes are simmering, prepare garlic, ginger, onion and mushrooms. Add 2 TBSPs sesame oil to a stock pot over medium heat and add everything except garlic. Saute for 5 minutes and add garlic in the last minute, stirring frequently. 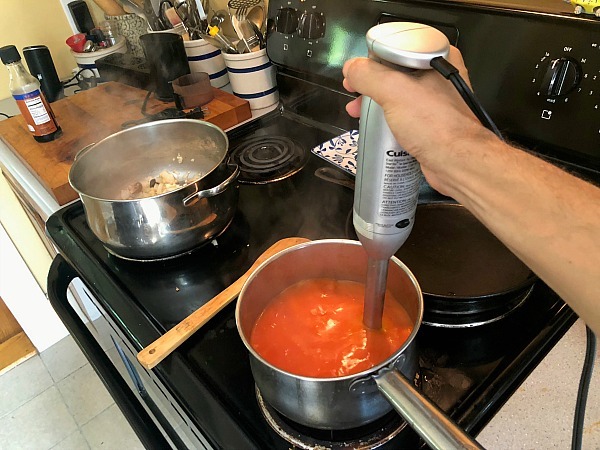 Add dashi broth to tomatoes and puree with a handheld immersion blender until smooth. Add tomato-dashi broth to vegetables and simmer another 5 minutes. Add 2 TBSPs soy sauce and taste. Add more, if desired, to taste. Add bok choy, turn off heat and cover with a lid. Greens will wilt and white stems will soften. Prepare fish however you'd like - pan fry in sesame oil, broil, bake or grill. You can start this step (and the next one) while soup is simmering. Prepare udon noodles according to package directions. If using fresh udon noodles, place in boiling water, turn down heat and gently simmer for one minute. Immediately remove from heat, strain and submerge in cold water to keep them noodles from cooking further. Mix with 1 TBSP toasted sesame oil. 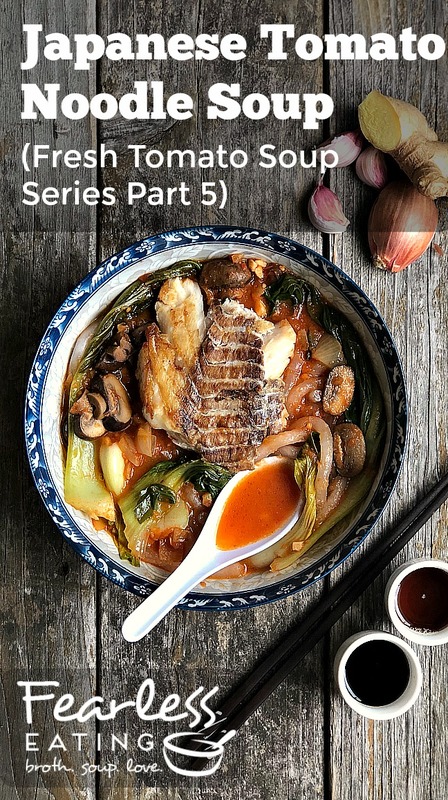 Place a handful of noodles in individual bowls, ladle soup over the noodles and place fish over. Season with additional soy sauce, toasted sesame oil and green onions, to taste. Part 6 – Coming soon!